AirsoftMegastoreTV.com has launched a fresh new look for 2012, making it easier than ever for Airsoft enthusiasts to access Airsoft-related contests, Airsoft gun reviews, news, and free giveaways. The site's new layout empowers visitors to easily access Airsoft content, reviews, news, and free giveaways, while also providing them with a place to connect with the Airsoft community at large. Airsoft Megastore has launched brand new site design for their groundbreaking “infotainment” channel, AirsoftMegastoreTV.com. The site now features a cleaner, more user-intuitive layout with enhancements that make the site much easier to navigate. The new site design is now broken down into several categories so that the visitor can easily find the information they are looking for. Some categories include: Reviews, Chrono Test, Shooting Course, Tech’s Corner, Teasers, PSA, Giveaways and Downloads. The result is a site layout that empowers visitors to better access Airsoft content, reviews, news, and free giveaways, while also providing them with a place to connect with the Airsoft community at large. The purpose of AirsoftMegastoreTV is to bring Airsoft to masses by providing a comprehensive collection of the highest quality Airsoft-related content available on the web. The Airsoft Megastore TV Infotainment channel aggregates useful and entertaining airsoft resources including Airsoft product review videos, informative Airsoft tech tips, how-to videos, the latest Airsoft guns and gear, as well as the latest company and Airsoft-industry news. The site also unifies Airsoft Megastore’s social media presence, making it easy access to the company’s Facebook and YouTube accounts, providing airsoft enthusiasts with yet another way to connect, learn and enjoy themselves. 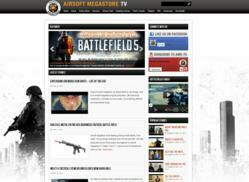 AirsoftMegastoreTV was first launched on February 2011. The site attracted more than 2000 visits in the site’s inaugural month, proving the demand for reliable and entertaining Airsoft information resource. Today, the Infotainment channel is updated daily, so that visitors check in and engage with the site often. It features one-of-a-kind, entertaining and informative Airsoft videos shot in full 1080P HD and is dedicated to providing the Airsoft community with objective Airsoft gun and accessories reviews, technical how-to videos and industry-insider news. All video content can be viewed on a mobile device, computer or streamed directly to an HD-capable television. Airsoft Megastore is North America’s fastest growing retailer of high value Airsoft guns, ammo and accessories. The company is purposefully based in Southern California, the ideal North America location for proficient importing from Airsoft manufacturers in Asia. Airsoft Megastore’s primary objective is to bring the sport of Airsoft to the masses by providing high quality, high value Airsoft products, including Airsoft shotguns and Airsoft sniper rifles, as well as Airsoft mags, pistols and competition grade Airsoft Ammo at the lowest possible prices. All of Airsoft Megastore’s products are backed with a 125% lowest price guarantee, ensuring their patrons that they are indeed the best value on the web.